There was an ugly woman in the state of Qi during the Warring States Period (475–221 B.C.) who was still single at the age of 40. One day, she came to the king’s palace and asked to marry the king. The strangest thing was, the king did marry her and even made her the queen. Wuyan is the name of a place as well as a woman. Historian Liu Xiang of the Western Han Dynasty (206 B.C. 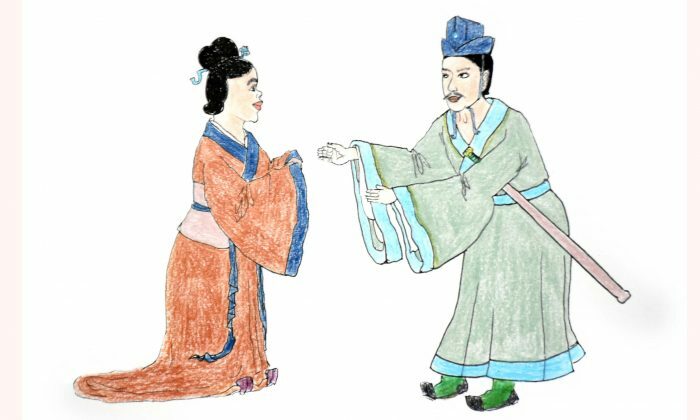 to A.D. 24), in the “Biographies of Exemplary Women, Zhongli Chun of Qi” that he edited, described Wuyan as having unparalleled ugliness—a protruding forehead, a jutting chin, sunken eyes, an upward-tilted nose, a thick neck, little hair, a pigeon chest, a hunched back, and a dark complexion. But Wuyan was not bothered by her looks. Neither did she care that she was still a spinster at 40. This was during the reign of King Xuan of Qi. He was about to have a feast with his officials when the guards informed him that an ugly woman was offering herself to be a cleaner in the harem. Everybody roared with laughter. “What an eccentric woman!” they said. King Xuan became fascinated. He said: “I’m keen to see it. Can you show it to me?” Before he could finish speaking, Wuyan had vanished into thin air. The king was dumbfounded. He lost no time in finding books on invisibility, and he started studying them. But he could not figure out how Wuyan had disappeared. He summoned Wuyan the following day, and she came. The first crisis, she said, was that Qi was confronted by formidable foes, but King Xuan had not yet established credibility as a leader. If anything happened to the kingdom, morale would be threatened. The second crisis was that the people were weary from the building of the majestic terrace. The third crisis was that people of virtue were living in seclusion, and those by the king’s side were traitorous and disloyal. The fourth crisis was that the king indulged himself in making merry instead of devoting all his time to running the state. Danger lurked beneath the surface. King Xuan began to take Wuyan seriously. This was not an ugly woman left on the shelf, but an absolute godsend. He had the five-story terrace demolished, stopped making merry, and dismissed people who curried favor with him. He also proclaimed his son as the crown prince and was even more filial to his mother. Wuyan was invited into the palace, not to be a cleaner or a concubine, but the queen. In China’s history, Qi was one of the seven states during the Warring States Period, and it was the last state Qin destroyed to unify China. It had over 10,000 chariots, and it was the “national university of Qi” from which the Contention of a Hundred Schools of Thought stemmed. According to the “Biographies of Exemplary Women,” Zhongli Chun was an upright person who spoke with eloquence. It was to her credit that King Xuan was able to transform Qi into a strong state.